The Latin word "religio" is the root for our word "religion." It means to tie, bind or fasten in the way that you might moor a boat. In a world of coercive and persuasive powers that compel and draw us as moral, intellectual and aesthetic beings, religion is the way that we seek orientation, or the mooring appropriate for our time and place. We bind ourselves to others in the past and present, we become connected to them as we try to live as humanely as possible. 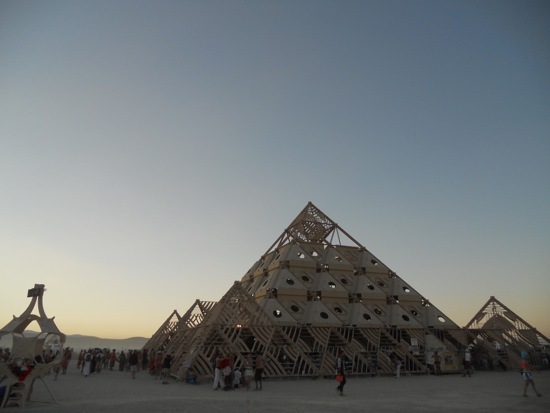 It is in this sense that I regard Burning Man as one of the largest religious rituals in the western world. We danced, created and destroyed things together. We talked, cried, yelled and sat in silence. We came to the holy desert from wildly different places, but even in our ecstasy and despair, mostly we were one -- like the future city that John of Patmos calls the New Jerusalem. Burners greet each other with hospitality saying, "Welcome home!" For me this means, "express your wonderful uniqueness, because we act as a kind of family for each other." I talked about God with Vedic priestesses, Unitarians, yogis, Quakers, entheogen voyagers, Episcopalians, Hindus, Roman Catholics, shamans, atheists and Zen teachers. I met people there who hate Christianity, people who, often for good reasons, associate it with bigotry and condemnation. But this was a minor part of my experience. Mostly in that holy desert we shared what we have in common. In outlandish costumes, creating breathtaking works of art, building friendships we tried to express more completely who we genuinely are. Perhaps for a short time we could even see ourselves and others more clearly as children of God. This year's theme "Cargo Cult" refers to religions established in the Pacific theater during World War Two when islanders first experienced the tremendous wealth and material power of American soldiers. After the war these peoples designed ritual acts and stories hoping to bring back the cargo that had disappeared. In our context this anthropological phenomena concerns the connection between the things we own and what we believe, the relation between spirituality and science, the primitive and the modern, superstition, technology and the holy. 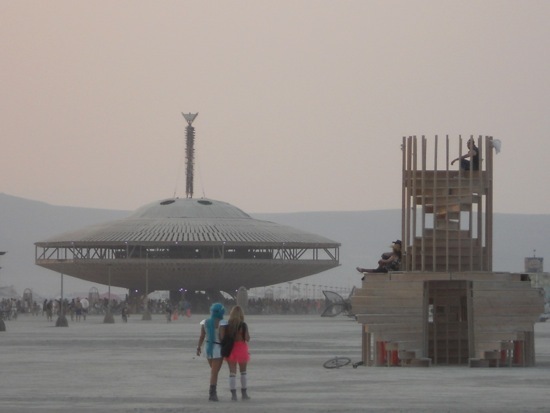 The massive structure at the heart of everything was the Burning Man, standing on a spaceship, inviting participants to imagine an encounter with a vastly different culture and how it might change our self-understanding. Among the three hundred different official art installations many explicitly employed religious symbols. On the Playa this year artists constructed at least four churches (including the very Protestant-looking "Church Trap," and the more Catholic "Photochapel"), along with a variety of temples and pyramids. The artists may not have intended it, but I felt strangely at home in each of the churches as they gestured to the poverty, grandeur, oddness and ordinariness of our longing for God. I enjoyed playing a church organ in one at sunrise. 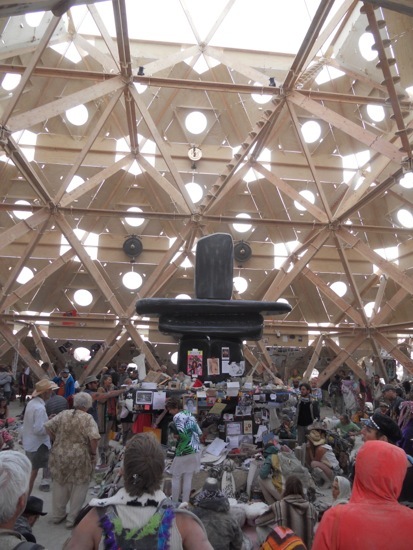 Perhaps the most spectacular place we shared in common was called "The Temple of Whollyness." By the end of the week this pyramidal holy space, for prayer, meditation and yoga, had thousands of inscriptions written on it. These could be funny and thoughtful. Often they expressed pain like, "Let my dad be happy, and don't let me go down the same path," "I'm done living in my anxious past," or "Mom and Dad. Please find it in your hearts to forgive each other. I love you." People wrote about searing losses. In this place they cried together and realized again that everything we know and love will one day die. The temple seemed like a physical embodiment of the line the priest says in the Ash Wednesday liturgy, "Remember that thou art dust, and to dust thou shalt return." A young woman mourning the end of her eight-year marriage asked me to come and pray with her as she left a box of wedding memorabilia at the temple to be burned. The next night as the shamans leaped and the chanters droned and the flames devoured the temple, she experienced this as a divorce ritual, a way of laying down burdens that she no longer needs to carry. What if churches could be more like this? Could they be less segregated by belief and family background? Would it be possible for them in the original spirit of "religio" to bring together all kinds of people into an experience both of our mortality and our connection to God? Perhaps instead of always building for eternity, Christians should do more to make visible the temporary holiness that unites us. 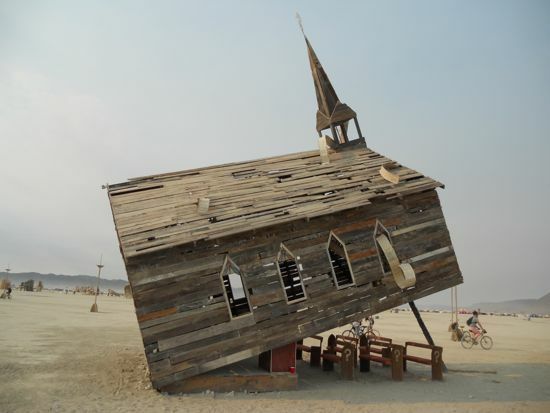 This is the second article in a three part series about Malcolm Clemens Young's experiences as a Christian pastor at the Burning Man festival in Nevada. A version of these pieces appeared in The Los Altos Town Crier on Sept. 25, Oct. 2 and Oct. 9, 2013.